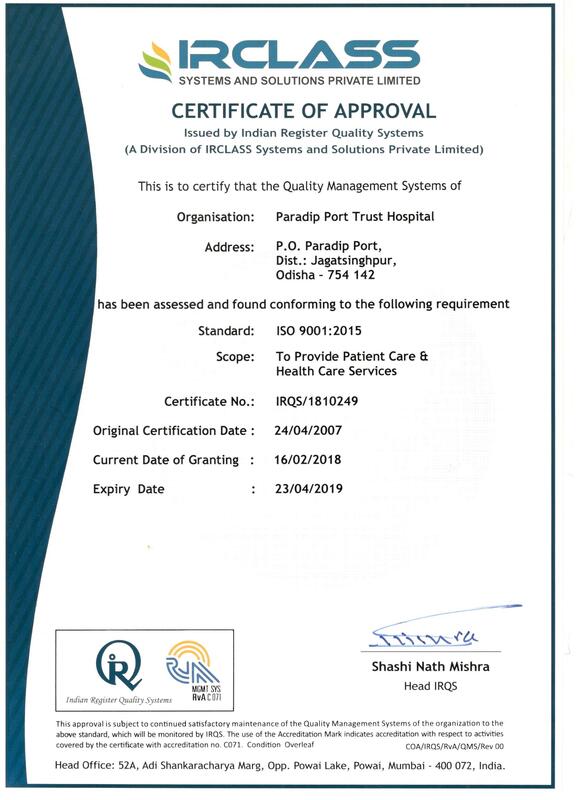 Paradip Port Trust Hospital is ISO 9001:2015 certified, 64 bedded multidisciplinary hospitals established by Paradip Port Trust and operating in the township of Paradip Port. Speciality facilities available include Medicine, Cardiology, Surgery, O&G, Ophthalmology, Dermatology Psychiatry etc. besides Pathology, Radiology, Occupational health, Physiotherapy and sanitation facility. Equipped with the latest in testing gadgets PPT hospital provides the best possible diagnostic facility in the region. The hospital has its’ own waste managements and sewage treatment facilities to take care of environmental concern and surrounding ecosystem. Certified by pollution control board, Govt. of Odisha, the waste management system is a role model in the state. PPT Hospital under Corporate Social Responsibility (CSR) participates in various government health programmes like Janani Surakhaya Jojana, Priminster Surakhita Matrutwa Abhijan, FICTC for AIDS detection etc. The hospital observes global health awareness days like World Health Day, Word Diabetic days, World Heart day and AIDS day, to name a few to provide free disease detection and health service facility for the community in and around Paradip Port. Under CSR provision the hospital also offers free treatment to family below poverty mark. Located in a clean and green environment, the hospital provides curative as well as preventive health care facilities. It’s the only hospital in the region to provide a standard mortuary facility for the deceased. With multitudes of health care services the hospital is unique in itself.